There is lots to keep your eyes out for in the run up to Christmas....and maybe in the first part of 2019! First off, head over to our You Tube channel and set a reminder for THURSDAY 22ND NOVEMBER at 7PM! 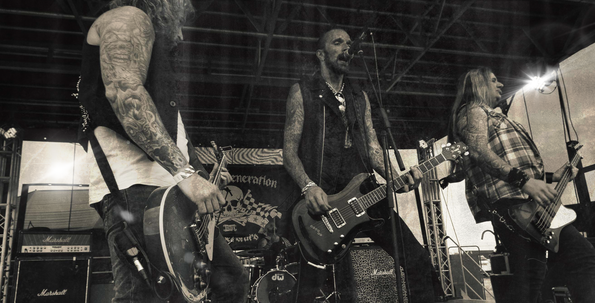 There will be an exclusive premiere of footage shot at STONEDEAF Festival in Newark in August this year. NGS were invited to play the TOTALROCK Radio stage for a celebration of legendary Tommy Vance. Exclusive footage was captured by MEDIA EXCENTRIQUE (Warren & Jamie) so massive thanks to them! Also, thanks to Dazzle Rebel for the artwork! There is more to come, so strap in and buckle up! A new era dawns for NGS. After several months of auditions for the perfect addition to the NGS rhythm section, Underdog Records LTD and Forbidden Management are proud to announce the appointment of Gaz Wilde as permanent drummer. Gaz has a rich history in the Rock Industry . From playing in underground Glam band Sinful Kixx in the 90's, being a founder member of Ratt Pack and Knock out Kaine, and more recently playing with Rocky Shades in Wildside Riot. When he is not smashing the skins, Gaz records, produces and mixes the tracks of other artists at his own studio (Insonic Studio). We know you will all be eager to welcome him to the NGS family. 20th July - Gruta 77, Madrid, Spain. 21st July - Mestarock -Spain. 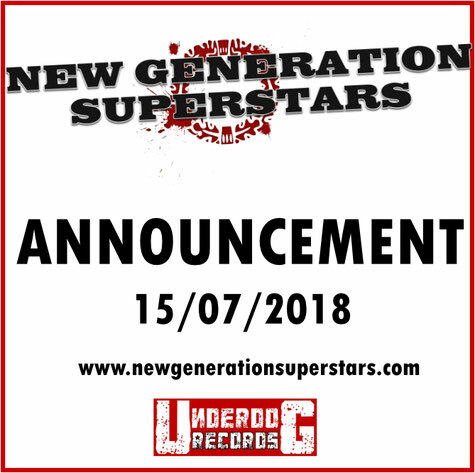 Very Important News coming soon regarding the NGS line-up!! Stonedeaf Festival in Newark, Notts. This will be on the exclusive Total Rock takeover stage on Friday 24th August. 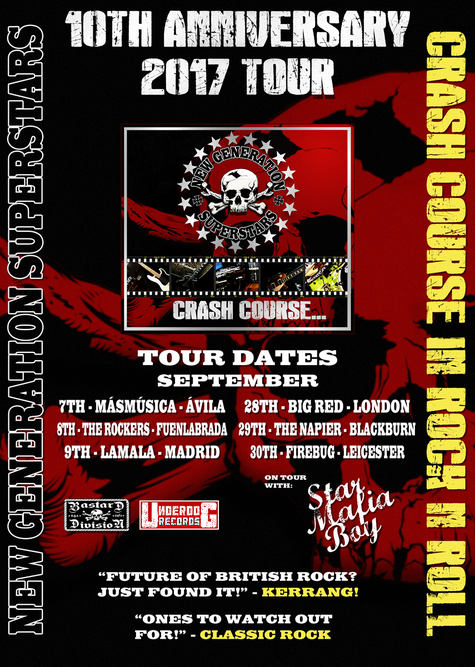 10th Anniversary of "Crash Course in Rock N Roll""
September will see the 10th Anniversary of the "Crash Course...." CD. This will be marked by 6 dates, 3 in Spain and 3 in the UK. Overload (Original Version), Done Before (Original Version), Not Every Day and Rocketboy. This can be ordered on the web store. 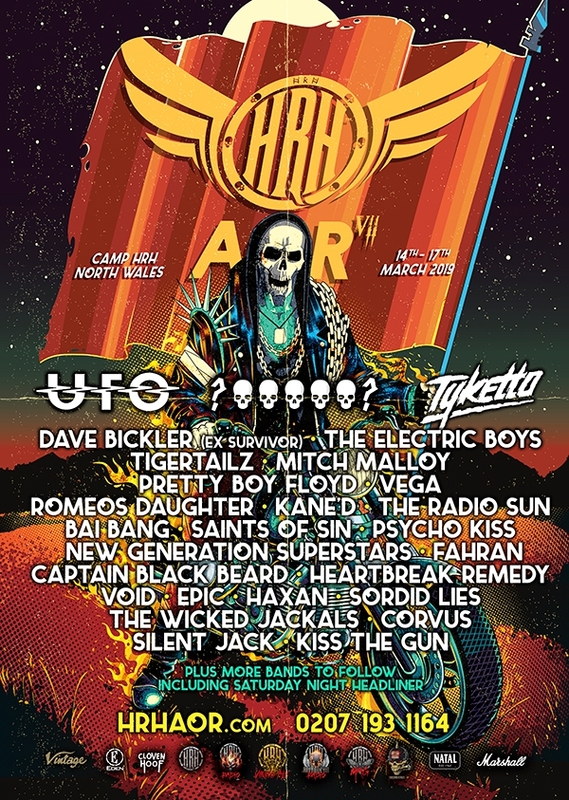 Seven Sins Festival, Swansea - Saturday 1st July 2017. Rock and Blues Festival, Derbyshire - Acoustic Set (B-Division) Saturday 29th July 2017. Rebellion Festival, Blackpool - Thursday 3rd August 2017. Hard Rock Hell Sleaze, Sheffield - Saturday 2nd September 2017. 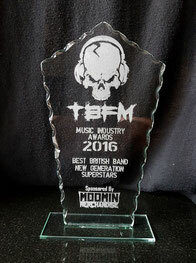 NGS Voted "Best Band" of 2016 by TBFM Radio (HRH Radio) Listeners! Thanks to EVERYONE who voted for us, EVERYONE who got us to where we are today, we could not do it without you guys! Huge thanks to TBFM Radio! who have always supported what we do...and congratulations on becoming Hard Rock Hell Radio! "King of the World" Availale NOW! 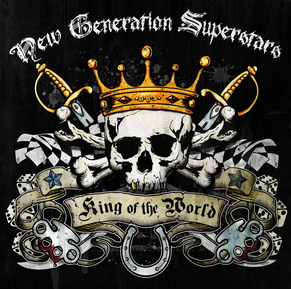 New Generation Superstars are pleased to announce "King of the World" is on general sale! . Please visit our store for CD and Vinyl, Digital release will be on Music Glue. 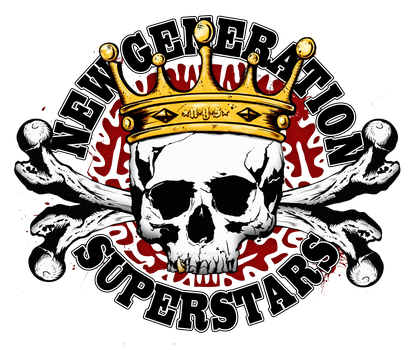 The band will be delivering hard hitting riffs with some exciting changes, that will still be faithful to the distinctive NGS Rock N Roll sound. Already being hotly tipped for as one of the notable releases for 2017, Video "King of the World" has now been released with an accompanying digital download for sale.